Please join us for DDO's oldest and longest running in game event. Since 2008, this event has been running. It's our 10th year. I'm proud that we've never, made a single political statement, we have no intention period other than remembering and honoring the men and women who died while serving in the military, on the last Monday of May. 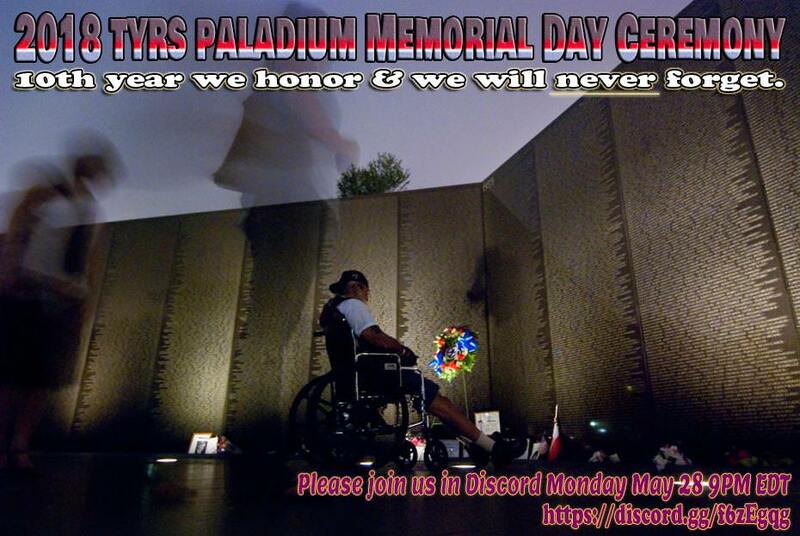 Initially an event honoring those we lost from the US military, these days we honor those lost in all countries our guildies and friends reside in. We spend time with friends and families, and all members of our ceremonies have someone in mind when they come to our events that they would like to honor. WE STAND WITH YOU. Check out our OFFICIAL FOLDS OF HONOR PAGE and DONATE in Honor of a family or friend who gave his life serving his or her country!! Last edited by LeslieWest_GuitarGod; 05-28-2018 at 12:21 PM. No Drama. Cameraderie. TEAM Focus. That's the TYRS way. If that's your style, come join us! Research our Guild here: Read our official Recruitment thread | Sign up here: Tyrs Guild Website! | GHALLANDA GUILD LEADERS: Join the Fellowship! 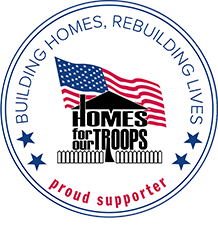 The Tyrs Paladium guild are proud sponsors of Home for our Troops. We will be launching our drive on Memorial Day, to be continued until Veteran's Day. We consider our Memorial Day and Veterans Day gatherings solemn occasions to share time together in game, and to make a different outside of the game, as well. Come join us. from any guild, any server anywhere in the World. As we have for the past 10 years, we will meet in the Ghallanda House J's Temple of the Sovereign Host. We will start at 9pm SHARP. All guilds, All servers, anyone from any nation who wishes to honor someone who sacrificed it all. WE WILL STAND WITH YOU and HONOR THEM. Last edited by LeslieWest_GuitarGod; 05-24-2018 at 12:04 PM. We are about to embark on perhaps our greatest adventure yet. Our finest guild event. 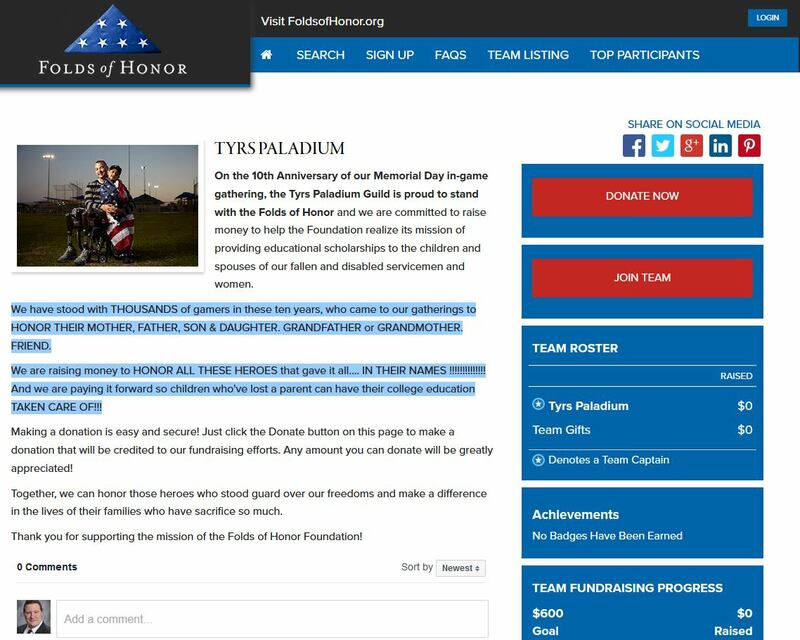 On the 10th Anniversary of our Memorial Day in-game gatherings, the Tyrs Paladium Guild is proud to stand with the Folds of Honor and we are committed to raise money to help the Foundation realize its mission of providing educational scholarships to the children and spouses of our fallen and disabled servicemen and women. I have stood with THOUSANDS of gamers in these ten years, who came to our gatherings to simply HONOR THEIR MOTHER, FATHER, SON & DAUGHTER. GRANDFATHER or GRANDMOTHER. FRIEND. Right now... we are raising money to HONOR ALL THESE HEROES we gathered to remember, who gave it all.... IN THEIR NAMES !!!!!!!!!!!!!! And in their names, we are paying it forward so children who've lost a parent can have their college education TAKEN CARE OF!!! Making a donation is easy and secure! Just click the Donate button on this page to make a donation that will be credited to our fundraising efforts. Any amount you can donate will be greatly appreciated! Together, we can honor those heroes who stood guard over our freedoms and make a difference in the lives of their families who have sacrifice so much. Whether your loved one was from the Americas, Canada, England, Germany, Australia, Ireland, Italy or from any other country... THIS IS FOR THEM. Thank you for supporting Tyrs Paladium, and more importantly, the mission of the Folds of Honor Foundation! Check out our OFFICIAL FOLDS OF HONOR PAGE and DONATE!! Last edited by LeslieWest_GuitarGod; 05-26-2018 at 02:44 AM. ALL are WELCOME to join us for our 2018 MEMORIAL DAY Ceremony. All members of Tyrs Paladium, the DDO and NEVERWINTER FELLOWSHIP alliance, the greater DDO community and anyone else who would like to share this solemn time with us. Thank you.